Thorncliffe Park is a densely populated, multicultural neighbourhood in central east Toronto, Ontario, Canada, in the former Borough of East York. East York merged with five other municipalities and a regional government in 1998 to form the new "City of Toronto". It is commonly considered to be bounded on the east by the Don River, on the west by Millwood Road, on the north by Wicksteed Avenue and Research Road, and on the northwest by a railway track between Millwood and Wicksteed. However, the official community planning area named Thorncliffe Park includes the neighbourhood to the north of the railway tracks, east of Laird Avenue, south of Eglinton Avenue, and west of the Don River. Thorncliffe Park has both an industrial and a residential section. The residential section is in the south, and consists chiefly of 34 high-rise and low-rise apartment buildings grouped in and around a rough oval with Overlea Boulevard dividing Thorncliffe Park Drive. Some condominiums (in a converted office building) and townhouses have recently been added on Overlea. Retail establishments, such as East York Town Centre, began to appear in the areas north of Overlea Boulevard, as Toronto's industrial sector declined. Overlea Boulevard used to be the dividing line between the industrial and residential sections, but the decline of the industrial sector in Toronto has led to the appearance of retail establishments and service organizations in the former factories on the north side of Overlea Boulevard. The residential section of Thorncliffe Park was originally designed as a planned community for 12,500 residents, but now houses 30,000. The neighbourhood is heavily served by 24-hour public transit provided by the Toronto Transit Commission. The neighborhood is also home to one of Toronto's oldest community gardens. Thorncliffe Park Garden Club is located on hydro land north of Overlea Blvd. and provides garden plots to approximately 100 local residents and their families on a non-profit basis. Gardeners also donate fresh produce to local community agencies such as the Scott Mission. 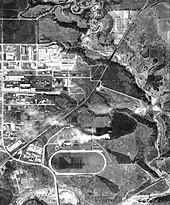 Aerial view of East York in 1942, with Thorncliffe Park Raceway visible to the south (bottom). The race track operated from 1917 to 1953. The site of Thorncliffe Park was a farm owned by Robert T. Davies, the wealthy founder of the Dominion Brewing Co. An avid participant in horse racing, under the banner of Thorncliffe Stable, he raced both Thoroughbred and Standardbred horses. After Davies' death in 1916 his estate sold the property to a group of investors from Baltimore, Maryland who built the Thorncliffe Park Raceway racetrack. The track was home to thoroughbred horse racing and harness racing from 1917 until 1952 when it was sold for real estate development. Today, the old racetrack site is commemorated by two streets named Grandstand Place and Milepost Place and the number of buildings that took on racetrack stable names like Churchill, Maple Glen and Wellow Glen. In the 1950s, developers tore down the racetrack and created one of Toronto's first high-rise neighbourhoods. The neighbourhood embodies some standard urban planning ideas of the era – high concentrations of similar housing types, strict separation of retail and residential development, and the assumption that everyone has a car. Low-rise buildings are clustered inside the enclosure created by Thorncliffe Park and Overlea, while high-rise buildings line the outside of Thorncliffe Park. Retail establishments were concentrated in a single shopping mall, now called the East York Town Centre, between the two arms of Thorncliffe Park Drive at Overlea Boulevard. Smaller retail and service plazas have recently opened along Overlea Boulevard. Many residents on Thorncliffe Park Drive are at considerable walking distance from shops, although this problem is mitigated somewhat, even in winter, by well kept sidewalks and walkways and by frequent bus service. 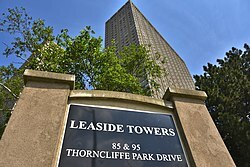 The residential twin Leaside Towers are by far the tallest buildings in East York. In 2001, immigrants constituted 66% of the population of the Community Planning Area, and recent immigrants constituted 87%. [dubious – discuss] Twenty-eight per cent of the residents spoke a language other than English or French at home, with the most frequent being Urdu and Gujarati. In Toronto as a whole, immigrants constituted 49% of the population, and recent immigrants 11%; 19% spoke a language other than English or French at home. Median household income in 2001 was $38,404 Cdn. ; the median income in the entire city was $45,251. Twelve per cent of the families in the Community Planning Area were officially classified as having low household incomes, while 5% of the families throughout Toronto were so classified. Many religious backgrounds are represented in Thorncliffe Park by religious meeting places such as Greek Orthodox Metropolis, Thorncliffe Park United Church, Saint Edith Stein Catholic Church, St. Demetrios Greek Orthodox Church, Islamic Society of Toronto, and more. English is the most popular language. Marc Garneau Collegiate Institute is a public secondary school in Thorncliffe Park. It is operated by the Toronto District School Board. The Toronto District School Board is a secular English public school board that operates several schools in Thorncliffe Park. Thorncliffe Park Public School and Fraser Mustard Early Learning Academy are the two schools in the residential area. Valley Park Middle School serves as the middle school from grades 6-8 for both the Thorncliffe Park and the Flemingdon Park area to the east. The high school that also serves both communities is Marc Garneau Collegiate Institute They are all within a 20-minute walk or 5-minute (or shorter) drive of pupils' residences, while buses take pupils to (Catholic) separate schools and also the middle and high schools. In 1998, the middle school, Valley Park Middle School located in Flemingdon Park, an adjacent neighbourhood to Thorncliffe Park, stood at around 1,000 students. As of 2007, the school has in excess of 1,200 students. In addition to the Toronto District School Board, three other public school boards also operate in the city. The Toronto Catholic District School Board (TCDSB), is a public English separate school board; Conseil scolaire Viamonde is a secular French public school board; and the Conseil scolaire de district catholique Centre-Sud is a French separate public school board. However, neither French school boards operate a school on the Thorncliffe Park. Opened in 2009, Francis Mustard Early Learning Academy is a public Junior and Senior Kindergarten-only school operated by the Toronto District School Board. On June 16, 2009 Education Minister and local MPP Kathleen Wynne announced 12 million dollars in provincial funding to rebuild the school so the students would not have to be in portables. In 2013, the rebuild was almost complete, with the Fraser Mustard Early Learning Academy almost ready to house almost 700 kindergarteners and 85 staff members. The Academy is a kindergarten-only school, with 26 classrooms covering 80,000 square feet, and cost around $24.6 million to complete. The school features a large muscle area and exercise/play courtyard for Kindergarten students; three gymnasiums; an advanced library system with indoor / outdoor theatre; and several enclosed courtyards with gardens for hands-on environmental studies. The local elementary school, Thorncliffe Park Public School was built in 1961. It is a K−5 school that began seeing signs of overpopulation in the late 1990s. It was largely overpopulated when in 1998 it had a student population of 1,500 and as many as 40 portables filled the schoolyard. The following year students had to be sent to the nearby Don Mills school due to a lack of space. Parents objected to this and Thorncliffe Public School began a massive addition. In October, 2003 the new addition opened and now Thorncliffe Park Public School is the largest elementary school in North America with a staggering 1900 students. In the summer of 2008 the soccer field and baseball diamond were paved over and 20 new portables were erected in their place prompting fears of further overcrowding. Thorncliffe Park P.S. has grown to over 2,000 students since 2003 and continues to be the largest elementary school in North America. ^ Toronto, City of (14 July 2017). "Data, Research & Maps" (PDF). toronto.ca. Retrieved 19 April 2018. ^ "Thorncliffe's all-day kindergarten school offers bright, purpose-built space for 700 - The Star". thestar.com. Retrieved 19 April 2018.